I believe that there were some boxings of this kit that labeled it as a MK. III, but in reality, it only builds into an accurate Mk.II. Once again, ESCI has done a fine job. 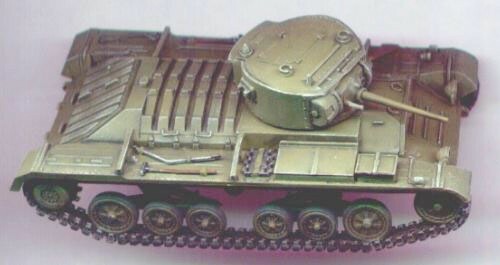 (Why does it seem that the best 1/72nd armor models are usually British vehicles?) Excellent detail throughout. Rivets in all the right places, good pioneer tools (separate parts), good hinges, hatches, etc. The bogie wheels and chassis detail are especially well done. All hatches are molded open: commander's, driver's, radio operator's, even the engine access doors can be positioned open (but no engine is included). The turret has a well-done basket extending down into the hull, with seats and spare shell racks; and there is even a pretty good gun breach inside the turret. A little bit of extra detailing, and it would be great to build this with an open turret hatch, with no figure blocking the interior view. I built mine pretty much straight out of the box. No additions or alterations. My kit was the ESCI/Ertl release with the hard plastic tracks. I don't know if it is the same with the vinyl tracks, but the the plastic ones did not fit beneath the rear fender without substantial grinding and sanding to thin the fender. I think I also took some off the top of the track links to get it to fit. Once complete, it's not noticeable. Other than that, the fit of the pieces was very good. The turret assembly needed some sanding, however, to eliminate some unsightly seams. Side skirts are included, but I left them off my model. To be honest, I do not remember if any figures are included in the kit. I built mine two years ago, and none are shown in the instructions. I painted my kit Tamiya khaki-drab and used the kit decals, which silvered slightly. Again, many of the unit markings were printed out of register.